Maps of water in the Martian atmosphere suggest the Red Planet once had an ocean that covered 20 percent of its surface. Most of that water was subsequently lost to space. Surfing may have been a more epic undertaking on ancient Mars than it is on modern-day Earth because of the possible existence of giant, slow-moving waves on the Red Planet, researchers say. These big waves might have carved shorelines into Marslong ago. If so, studying these shorelines could shed light on the ancient Martian climate, such as whether or not it had seas long enough for life to potentially develop on the Red Planet, scientists added. 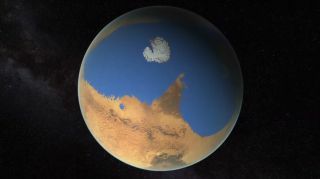 But researchers are still debating the existence and extent of ancient seas on the Red Planet. This is due in part to the fact that much remains unclear about what the ancient Martian environment was like. Because of that uncertainty, many questions remain about whether or not the Red Planet's climate was capable of sustaining liquid water on its surface for long periods of time. One unanswered question is whether or not waves on Martian oceans could have cut shorelines on the Red Planet. If waves did, uncovering signs of these past shorelines could strengthen the case for ancient seas on Mars and shed light on what the ancient Martian environment was like. "If you could identify a wave-cut shoreline on Mars, then we could tell you the minimum wind strength that must have occurred when that open-water sea existed on Mars," said lead study author Don Banfield, a planetary scientist at Cornell University in Ithaca, N.Y. In addition, since there is a link between wind strength and atmospheric pressure, "we would possibly be able to use a presence of a wave-cut shoreline to constrain the atmospheric pressure on early Mars," Banfield told Space.com. "This could go a long way to better constraining the ancient history of Mars' climate." The strength of waves depends greatly on the strength of the winds blowing on water, which in turn depends in part on the thickness of the atmosphere. The atmosphere of Mars is currently very thin: While the atmospheric pressure of Earth is slightly more than 1,000 millibars at sea level, the atmospheric pressure of Mars is now less than 0.5 percent of that, at 6 millibars. However, it is still unclear how thick the Martian atmosphere might have been in the past. "Estimates of between the current 6 millibars or less all the way up to 2,000 millibars have been made," Banfield said. The gravitational field of Mars is only 38 percent as strong as Earth's, making it easier for waves to rise on the Red Planet. The scientists found "that even at very low atmospheric pressure like on Mars now, you could generate waves if you could keep a liquid surface around," Banfield said. Assuming that Mars was once warm enough to have open seas that were not packed with ice, if ancient Mars had an atmospheric pressure of 50 millibars, it would have needed winds of 20 mph (32.4 km/h) or more for waves. If the atmospheric pressure was 200 millibars, winds of only about 9 mph (14.4 km/h) would have been needed. If the atmospheric pressure was about that of Earth's at 1,000 millibars, winds of just 3 mph (5 km/h) would have been necessary. These Martian waves would probably have shapes similar to the ones on Earth, "but they would move significantly more slowly on Mars than on Earth," Banfield said. "Because water waves move forward due to the force of gravity, and the surface gravity is smaller on Mars, the waves on Mars would move about half as fast as they would on Earth." One implication of slower waves "is that the waves can actually build to higher heights on Mars," Banfield added. For example, on Earth, given 44-mph (18 to 72 km/h) winds and an atmospheric pressure of 1,000 millibars, waves would be about 33 feet (10 meters) tall, but on Mars, those same conditions would produce waves that were about 72 feet (22 m) high. "I can imagine that surfing on Mars would be quite photogenic, but probably quite a bit easier," Banfield said. "The waves would be bigger for a given wind speed, and they'd move slower, so a surfer would look more heroic and the photographer would have more time to line the shot up well." Even if no wave-cut shorelines are ever found on Mars, that does not mean it never had waves. "It isn't certain that a wave-cut shoreline would survive to the present day if it were created 3.5 billion years ago," Banfield said. "The lack of a shoreline doesn't really help us say anything definitive." Still, Banfield holds out hope for discovering such shorelines on Mars, and not necessarily for purely intellectual reasons. "Part of the reason we study the planets is not only to better understand our own planet and our place in the universe, but also because it is fun to imagine oneself sitting on the edge of a sea on Mars, watching these very slow but quite big waves slowly lapping up on shore, even though the winds feel like they are barely ruffling your spacesuit," Banfield said. "The sun is a small dot as it drops to the horizon, but it still makes for a nice romantic setting with your favorite astronaut by your side." Banfield now wants to investigate what kind of shorelines might result from ancient Martian oceans packed with ice. "On Earth, when the wind blows on ice sheets, it pushes them onto shore, making big ramparts," Banfield said. "Perhaps these ramparts or their remnants exist on Mars, and if so, can we then use them to constrain the pressures and wind speeds that must have occurred?" Banfield and his colleagues Mark Donelan and Luigi Cavaleri will detail their findings in the April issue of the journal Icarus.